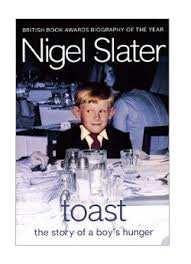 When I first read this book when it was first published I had really only a vague idea as to who Nigel Slater was. I had his “Real Fast” cookbooks which I used a lot but he hadn’t become the very recognisable TV cook of recent years. I’m not sure if I would have got a different impression of this had I read this more recently after seeing him so much on TV presenting his reassuring, comforting cookery programmes and food documentaries. Perhaps I would have found this memoir more of a shock. A very watchable TV adaptation was made with Freddie Highmore (Bates Motel) as Nigel and Helena Bonham-Carter as his step-mum but reading the book is the more valuable experience by far. I re-read this whenever I want a fast read which will have me laughing out loud and a few minutes later feeling close to tears. However well-written Nigel’s cookbooks are they do not have the same effect on me as this. Now in my household and my first introduction to spaghetti that is exactly how we ate it – plain and unadorned and I must say it was some years later before the experience was repeated. I’m really not sure why we did that- My Mum used to make Macaroni Cheese so must have known that it needed something on it. Luckily, in the Slater household they had a tin of “a slurry of reddy-brown mince that smells ‘foreign’”. With that addition things seem to be picking up, indeed the impressionable Nigel thinks he “wouldn’t mind eating this every day”, until that is, Dad remembers the drum of grated Parmesan cheese that he has been advised by a sophisticated friend to sprinkle on top. “Daddy, this cheese smells like sick,” I tell him. There is a danger to consider this to be a “celebrity biography” because to a point that is exactly what it is, but it is far more than that. This is Literature. It stands head and shoulders above most contemporary autobiographies because it is so well written and because of its disarming honesty. Family tensions and a coming to terms with his sexuality are all beautifully handled. It manages to be both touching and outrageous and was a highly deserved British Book Awards Biography of the Year Winner. A couple of years back it was one of the selected books to give out on World Book Night and I would have loved to have had a few copies to pass around. It also seems to be appearing as a book that is studied in schools and colleges and I am thrilled by that as it is truly a modern classic. Butterscotch Angel Delight anyone?